Thus, I knocked up a quick and hacky - with the stress on hacky - solution that allows me navigate GUI buttons with a gamepad. Note: Currently this is working only in a vertical up/down single column manner. So let's take the Main Menu. We're going to create an array with the buttons in THE ORDER THEY APPEAR ON SCREEN or it won't work. When we move up or down the array, we will move up and down the column of buttons. But before this, let's actually name the buttons and add a marker image to each of them so we can see what is selected. Each button is made a container, and the marker image is a child of that button. This means that it covers the button slightly. The image for the markers will be "core/art/gui/images/dropslider_d.png". 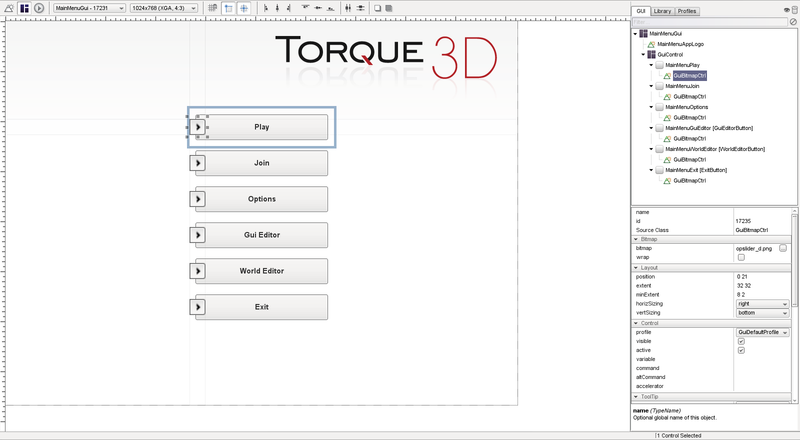 Here is what the new Main Menu looks like in the GuiEditor. The buttons have names and each one a child marker. Now for that array I was talking about. The gamepad will control the array/buttons via a new ActionMap called "gamePadGuiMap". We're going to use a $GLOBAL (Ancaps please stop foaming at the mouth) to keep track of WHICH GUI'S ARRAY IS CURRENTLY ACTIVE - because we might be doing this for all our GUIs if we want them to be accessible via the gamePad, and not just the MainMenu. When we use input from the gamePad, the array and thus GUI gets updated. We also wrap around the array if we move forwards at the end or reverse from the beginning. We hide the markers for unselected buttons, so only the selected button/index is shown. //how many things are we dealing with here? //use this var for storing which array key is selected. Default to 0, first button. Next up, we need to make the buttons actually do something when the active/selected button is activated. Of course this does not stop the mouse from intefering. So to use both mouse and gamepad together, we make sure that mouseOver a button also effects the gamepad array/selection. As we know the indexes of the buttons, we can call them directly. Add the functions for moving up and down the column of buttons and button array. And last but not least, we need an ActionMap for controlling the GUI via the gamepad and associated functions. At the bottom of scripts/client/default.binds.cs we initiate gamePadGuiMap. We navigate using the D-Pad up/down and activate the button using A on the gamepad. And here's what it looks like when the mouse overrides it. So, as I said, hacky, but it does work - if you have one column. If anyone actually has a working example of "GuiGameListMenuCtrl" or a better way of doing this please post it somewhere. And here's the full MainMenuGui.gui.